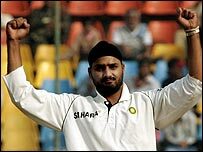 Surrey have signed India spin bowler Harbhajan Singh for the remainder of the county season. The 26-year-old, who previously played for the club in 2005, is available after being overlooked by the selectors for India's tour to England. "This is obviously a great opportunity and I can't wait to get out there and play some great cricket for Surrey. "I want to make every performance count, with both bat and ball," said Harbhajan, who will arrive on 2 July. He has taken more than 400 wickets for India in Tests and one-day internationals and hopes his spell at The Brit Oval will boost his chances of a recall later in the years. Surrey, meanwhile, see his acquisition as a boost after a difficult start to the summer in which they have failed to win any of their seven Championship matches so far. "We feel that a world-class spinner is an important part of improving performance in the second half of the year," said cricket manager Alan Butcher. "Harbhajan is a great wicket-taker and with the club expecting Azhar Mahmood to play for Pakistan in the Twenty20 World Cup later this year, we no longer have to worry about a possible gap in our line-up from August onwards. "Azhar has made a great contribution to the club, and it's clear that international duty is a distinct possibility for him later this year, so we want to be prepared."